and the roses and weeds as Lucy looks on. sometimes I forget to remember and remember to forget. sometimes I just am, not today, not now. some days are just not important and for no reason at all. this is not one of them, not today, not now. you’ve been waiting all year, me too. not sure who’s more excited? does it matter….not today, not now. no cards, no presents not today, not now. no words, no big parties not today, not now. what I do offer is forgiveness. it was growing in my garden among the weeds. did you know forgiveness is a four letter word for love? the anger got pulled with the weeds. the forgiveness I found among the roses. in the garden I call my heart. This entry was posted in Musings and tagged disc, Ed Sniecienski, forgiveness. 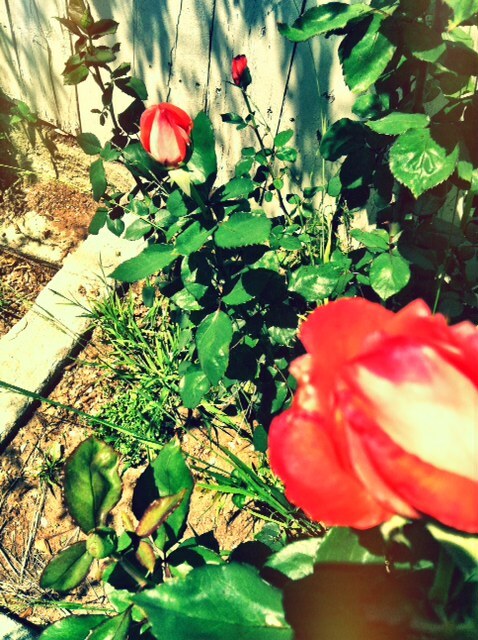 anger, It's your birthday, not today, Roses and Weeds. Bookmark the permalink. “Roses and Weeds” touched my heart. The piece reminded me of being present with the beauty and the not so beautiful and all that lies between those two forces and all that is around them too.